This cool little animation comes to us from MetaBallStudios from Spain. Keen on graphics, these guys decided to give the U.S. military a little treat and we absolutely love it. What they did here was probably for their own practice in rendering we believe. Having made 3D models of some U.S. war machinery, it would only make sense to make something neat out of it and that’s exactly what they did. Starting out with a single bullet, they quickly pan the video out to show a grenade, followed by claymores, assault rifles, a soldier and so on on so forth. Continuing on to tanks to planes to cruisers, they scale everything out so we get a really awesome perspective as to how big these things really are. You might learn some new things here too simply because you never thought about it. For example, did you think about the fact that a CH-47 Chinook sort of dwarfs the size of a B-2 Spirit? Or that a Titan II missile is almost as tall as a Arleigh Burke-Class destroyer? 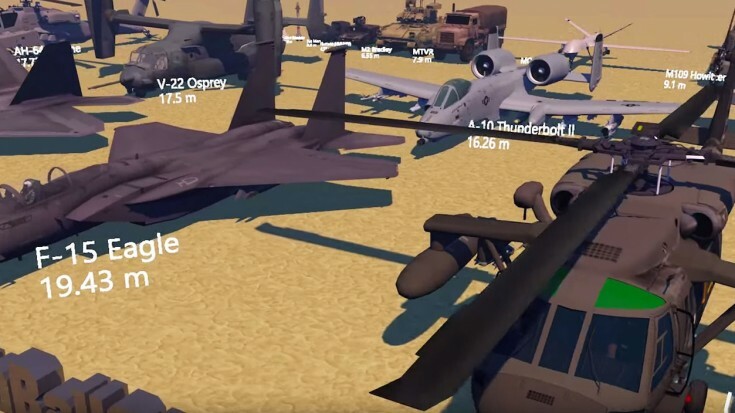 Blast this thing on full screen so you can see the descriptions of the various land, sea and air equipment. It’s really neat seeing all these weapons side by side. Enjoy!